Last year I kicked off a project where I had every intention of going through my entire game collection, from the 8-bit days through now, to find how many instances of the same game popped up in various game collection releases. I thought it would make for a neat feature. You know how it is; with each platform comes a reworking of a previous retro, franchise, or arcade game collection of some sort, and we keep adding them to our collections for some strange reason. I never finished counting, but the initial tally showed that for some of the more popular titles I had four or five digital copies of the same game. I'm sure it's even worse now! The last thing we need is another collection of old games, right? That's what I thought until I saw what Capcom put into their $29.99 downloadable Arcade Cabinet collection. You might have a few of the 15 arcade games from the years 1984-1988 in your library, but most of what's offered here is a bit harder to come by, and all come with new features, so any good game hoarder like myself would be happy to add these titles to their collection. 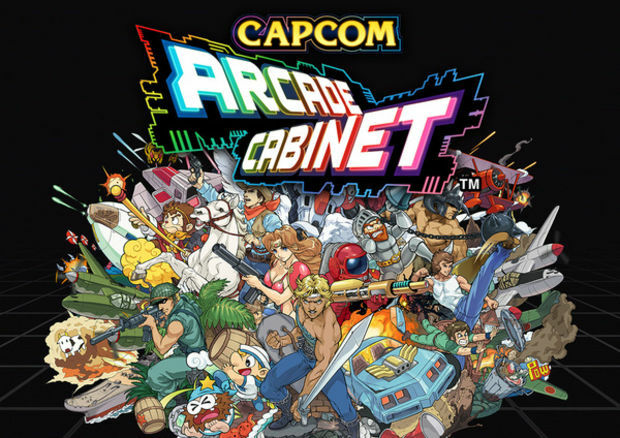 Upon initial download, Arcade Cabinet is essentially a container for the 15 games Capcom plans to release as game packs from February 19 through the middle of May. It comes with a demo for one game, side scrolling fighter Black Tiger. The first game pack comes available today for $4.99 or 400 Microsoft Points, and it includes Black Tiger, Avengers, and 1943: The Battle of Midway. A steady stream of packs and individual titles will continue to drop in the following weeks, on a bi-weekly schedule. The release schedule and pricing are as follows. Note that individual titles from game packs beyond the first offering will be available in the weeks after each pack's initial release. All of the individual titles are priced at $3.99, or 320 Microsoft Points. Two bonus games will be made available to those that purchase all 15 titles in an unlock. Capcom asked us not to reveal the names of these titles, but Google is your friend. If you don't mind waiting until May 21, All 17 games will be made available in a pack for $29.99 or 2,000 Microsoft Points. Compare this price to the $45 it would cost to buy each of the 5 game packs individually, or the $53 it would cost to buy each game individually. I believe Capcom is doing a disservice to those that would like to purchase all of the games of the collection from the beginning. There is no good reason for making them wait nearly three months to get the discounted rate. If anything, it makes more sense to make the ones that want to buy individual titles wait. This is a slight mark against an otherwise excellent collection of arcade games. 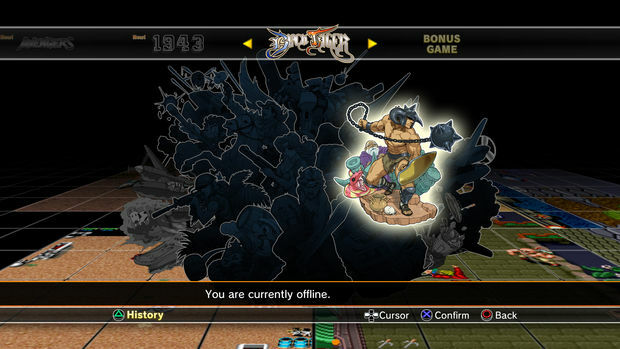 And while we're on small gripes, for strange and unclear technical reasons, the PSN version of Black Tiger will give players unlimited continues in the initial download of Arcade Cabinet, but XBLA players only get one continue, though they can restart as many times as they'd like. That's less on Capcom and more on the platform demo release rules, though. With all of that out of the way, I can tell you that Arcade Cabinet is a great collection of arcade gems. As a gamer in their mid-30s that grew up in Tokyo, I have fond memories of dumping Yen into many of these classics. Understand that some of my fondness for this collection relates to how nostalgia pulls on the heartstrings. Arcade Cabinet does a fine job at that. 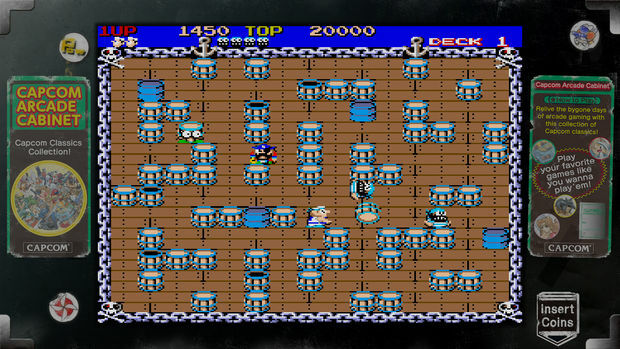 In the favorites category, I burned more hours on the super Japanese barrel rolling maze game Pirate Ship Higemaru than anything else last week. It's got that frantic throw/chase feeling that Bomberman gives you, but it has quite a bit more facial hair and striped shirts. Space jetpack shooter Section Z is a ball buster for sure, but something about it keeps you coming back. I think it's the impossibly slick music -- nothing sounded as good as this back in the 1980s. I also have a soft spot in my heart for SonSon, the endlessly scrolling platformer based on the Chinese Journey to the West fables. It's just so weird. And while I've been playing some of these vertical and horizontal shooters for decades now, I'm still not good at most of them. It's amazing how unlimited virtual quarters can keep you in a game, though. 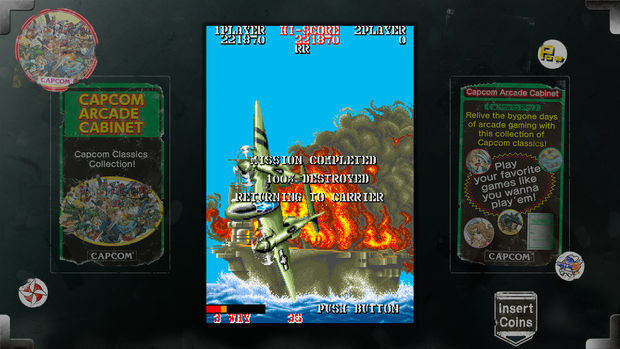 I managed to reach previously unseen stages in favorites 1942 and 1943: Battle of Midway. I wasn't any better at Side Arms, but blowing things up with heavily armed robots is a bit easier than with WWII era prop planes. 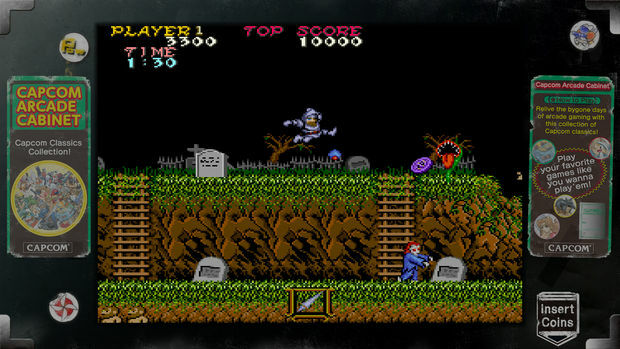 As for the games that everyone will love, count titles like Ghosts 'n Goblins, Commando, and its western variant, Gun.Smoke, in that category. These are titles with gameplay so good that they still hold up nicely some 25 or so years later. 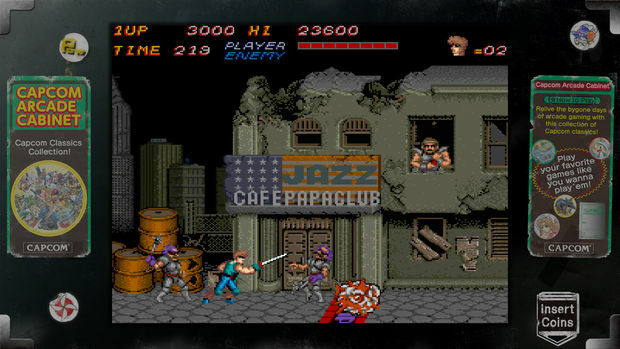 Commando still has the best snare drum sound of any videogame soundtrack ever, though that has nothing to do with gameplay. Who wouldn't love to get back into Legendary Wings and its mix of shooting, side-scrolling exploration, and eye-popping (for the time, anyway) graphics. 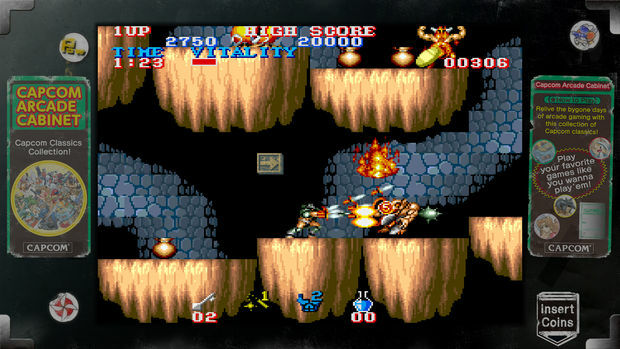 Even the initial free selection, badass-with-a-sword side-scrolling brawler Black Tiger, is a solid selection, though the difficulty might have you cursing at the screen. It's a quarter muncher if there ever was one. There's bound to be a few titles that won't speak to you individually in any collection. With its combination of on-foot and car play, The Speed Rumbler kind of reminds me of a really early Grand Theft Auto, though it's more of a mess, and much harder to drive in. Top-down brawler Avengers and sword-and-shield side scroller Trojan were my least liked. Trojan in particular. It doesn't have that classic shine that many of these others have. Oh, and it's too damned hard. I found that I stopped wanting to use my endless supply of virtual quarters on this title. Sure, you could switch on Arcade Cabinet's dumb-it-down casual mode, but what's the fun in that? All in all, this is a nice mix. Most of these titles have lasting power for me as digital games that I can quickly boot up and enjoy. A few things are missing, like late 1980s title Forgotten Worlds, though it may place just outside of their mid-80s time bracket. The other titles that are coming up in your head as missing are probably ones from the 1990's. Let's hope that Capcom does a collection for that era as a sequel to this. CPS2, please! It's nice to see that some care went into resurrecting some of the games that put Capcom on the map in this collection. First off, every game is represented beautifully, with full HD renditions that do not seem to tinker too much under the hood. The sound work is top notch, and goes a long way toward bringing you back to those days alongside the visuals. I love that an included music player lets you dial up the songs from the collection's soundtracks as you please too. 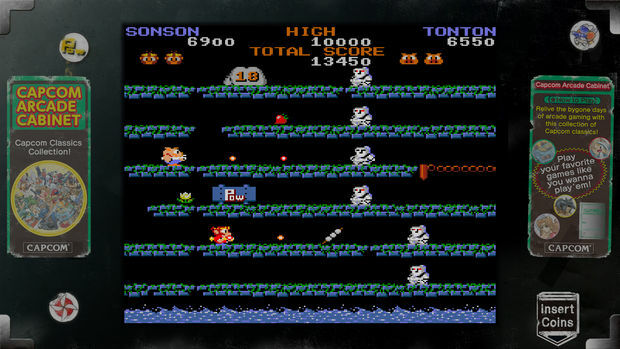 The biggest addition, and probably one of the main selling points of Arcade Cabinet, is that every two-player title supports online play over PSN or XBLA. Unfortunately, I did not have a chance to test out this early review code online. We'll update with impressions after launch. And as you'd expect, online leaderboards, Achievements, and Trophies have also been added to these classic titles. For those that like to dig down deep, Capcom has added full dip-switch functionality to all titles. If you don't mind messing with the original formula, feel free to play with difficulty settings or life counts. Cheater. Even the presentation is nice. Arcade Cabinet's menu is a lovely graphic that smashes together key characters and assets from all of the collection's games. You select the game you'd like by highlighting one of the many outlines in the graphic, and from there you're presented with a more standard menu. Adding to the slick presentation are unlockables; you'll find that bonus art, songs, and other goodies will unlock as you play thorough these games. A sort of museum menu lets you select any of your unlocked games to read about its background history. Finally, some system specific social features have been added to Arcade Cabinet. 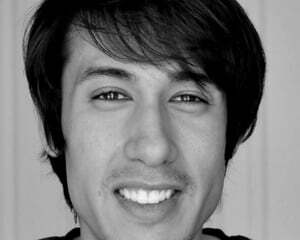 PS3 users can capture replays and upload them directly to YouTube. Xbox 360 users get screenshot posting to Facebook instead. The main draw for me for Arcade Collection is that I don't have to dig out any older systems or pop in any discs to enjoy these games. Being instantly accessible as PSN or XBLA downloads adds to their attractiveness for me as they make for perfect quick game fixes between bigger games. I do think that Capcom missed an opportunity with not releasing this collection for the Vita, as their work on it would have translated beautifully to the small screen. And Wii U owners are going to be up in arms about being skipped over. If you don't mind waiting until late May, Arcade Cabinet represents a decent value for the discounted $29.99 asking price over the $45 you'd pay for the five packs. I'm certain I spent over $50 in quarters in playing these titles for this review, if you'd like to look at it that way. Of course, if you already have some of Capcom's other collections, you'll need to decide for yourself if the online and social features make these re-releases worth the outlay. As far as titles go, there's nothing that could be considered new in the collection, though the new online features and presentation should not be glossed over.